After enjoying a shower and dumping our grey water tank we were on the road to Banff by 8:10. 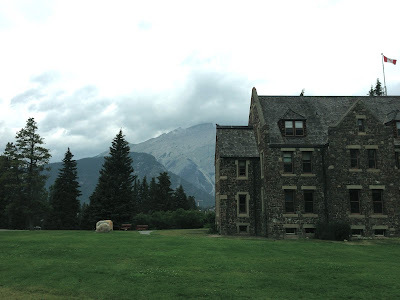 We meandered around Banff a bit, having breakfast and driving up to the old stone Administration Building and discovering Cascade Gardens there. 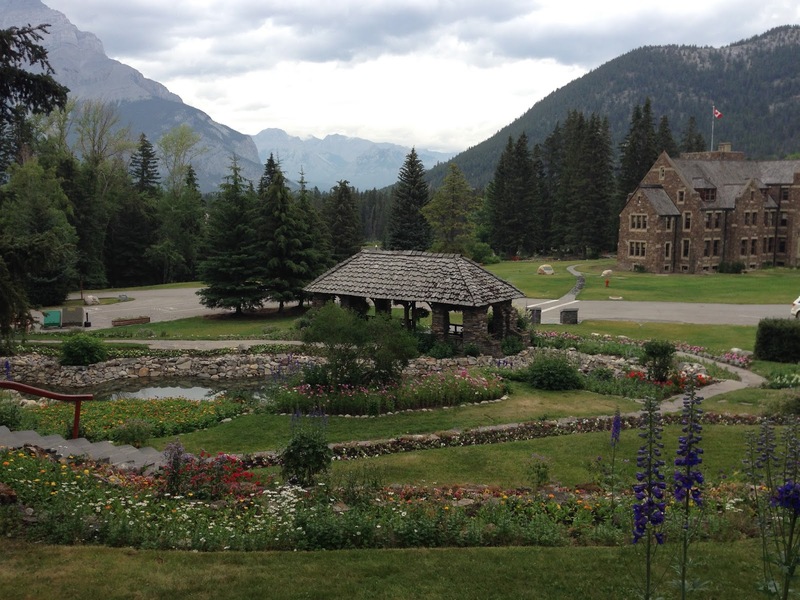 We ended up here while trying to find the Fairmont Banff Springs Hotel. The gardens were spectacular even though the water features were all fenced and empty while being upgraded. It was fun to watch as two brides and grooms were being photographed at the park and in front of the grand building. Parking on the street at the bottom of the hill, we climbed up to the Fairmont Banff Springs Hotel. 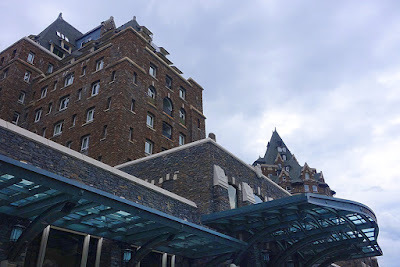 Along with all the other Lookie Loos we explored the lobby and the stores on the lower floors, an impressive hotel! I just checked the prices through Trip Advisor, mid week in September over $500.00 a night, I hope that's US dollars! along side the Bow River, watching Castle Mountain go in and out of the clouds. Alberta is wild rose country and they were growing along side the road! We stopped briefly in Lake Louise to find some sort of literature on the spots we would be passing. 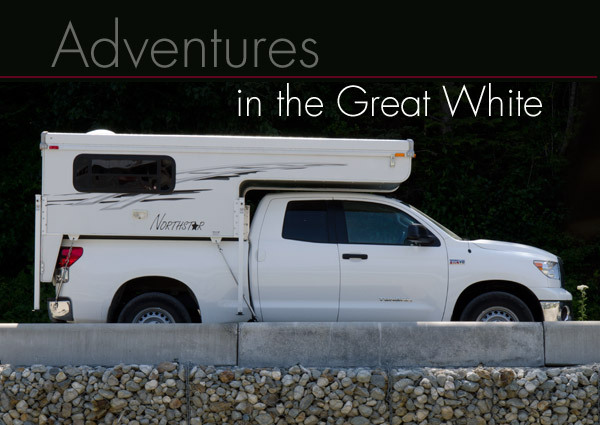 It was frustrating to drive along the parkway and not know what you were passing, the literature when we entered the park was not as informative as what we receive in our National Parks. Without being able to Google information we were lost! A tourist info person we talked to in Banff had suggested finding a campsite as soon as possible, we agreed and took her suggestion for the campground, and headed straight there. 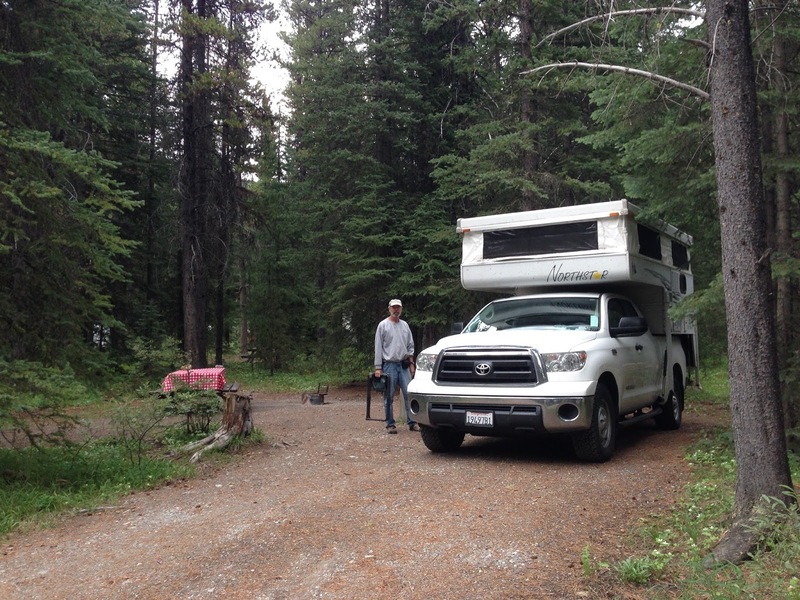 Waterfowl Lakes Campground was about 38 miles north on the Ice Fields Parkway. How sad it was to see all the free firewood available and a ban on fires. After we'd made arrangements for our campsite we headed back down the Icefields Parkway to explore what we'd missed. I think this section of Banff is probably the most beautiful road I've driven. The glacier fed lakes and glacier covered mountains are magnificient. The Bow Summit overlook is the most magnificent of all. In the picture above our campsite is near the fourth little spot of blue after the lake. 10 years ago we were here with Kaci, stopping at a trail to hike to a lake or glacier only to find out she hadn't put on her hiking boots. We gave her a hard time. I can't believe I did the same thing, maybe at the same place! I had my flip flops on and we start climbing and climbing and climbing to the most beautiful view. The hike was 1.9 miles. For the rest of the trip I wore my hiking boots as we walked to all sites! We drove back through Lake Louise to Lake Moraine, arrived at 5:00 and it was mobbed, took a look and headed back to our campsite at Waterfowl Lakes Campground. This black bear ran across the road right in front of us as we were driving back to our camp! It pays to be out and about in the evening. The river that ran beside the campground was quite wide and rushing. We spent our evening down enjoying the river. Our neighbors at this campsite had an interesting pop up tent they used as a changing room next to their tear drop trailer. I was talking to them about it, and as travelers do, we asked where each other were from. They were from Marin, I don't say I'm from Sonoma, why do people from Marin say, "Marin"? Small World. This campground was one of my favorites. Hope to return one day and spend more time.